THIS PURCHASE AGREEMENT (the “Agreement”) is dated as of _______________ (the “Effective Date”) by and between COMMERCIAL PROPERTY SELLER, a __________ corporation, (the “Seller”), and COMMERCIAL PROPERTY BUYER, LLC, a __________ limited liability company (the “Buyer”). 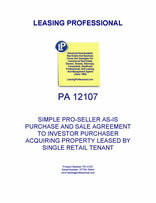 Seller hereby agrees to sell to Buyer and Buyer agrees to purchase from Seller the following described real estate as set forth on Exhibit “A” to this Agreement (“Real Estate”), in fee simple, together with all improvements thereon, and fixtures of Seller, which real estate is commonly known as _________________________, and is subject to a lease dated ______________ (“Lease”) to TRIPLE NET RETAIL TENANT, a ____________ corporation (“Tenant”). Subject, however, to all covenants, conditions, restrictions, easements, party wall agreements and community contracts of record, if any, including governmental restrictions and zoning laws. 1. The purchase price (“Purchase Price”) is ____________________Dollars ($________). Buyer agrees to pay as follows: ___________ Dollars ($______) (the “Initial Deposit”) at the signing of this Agreement. Buyer further agrees to pay an additional ______________ Dollars ($_______) (together with the Initial Deposit shall be the “Deposit”) at the expiration of the inspection period. The Deposit shall become non-refundable and transferred to Seller at closing. The Deposit shall be deposited with the office of _____________ Title, located at ______________, Attention _________, (the “Title Company”) as part of the consideration of the sale, with the balance of the Purchase Price to be paid in cash on delivery of a warranty deed, in the form attached as Exhibit “B” (“Deed”). a. Preliminary title report and all recorded documentation outlined therein. b. The Lease including amendments. c. Existing Environmental Reports, if any, in Seller’s possession. e. Existing As built survey, if any, in Seller’s possession. a. Counterpart original of an Assignment of the lease to Buyer in the form attached as Exhibit “D” (“Assignment of Lease”). 5. Brokers shall order a commitment for title insurance covering the Real Estate with instructions that such commitment be delivered to Buyer or Buyer’s authorized agent and to Seller or Seller’s authorized agent. Upon delivery of such commitment, and approval by Buyer, Seller shall forthwith deliver to the Title Company, for its approval and recording, the Deed from Seller to Buyer, free and clear of all liens and encumbrances whatsoever, except as herein provided. Buyer shall then and there pay to the Title Company, for the account of Seller, the balance of the Purchase Price. 6. Escrow fees, if any, shall be equally divided between Seller and Buyer. Seller shall be charged with expenses for the release of any mortgages of record, transfer and sales taxes, title insurance charges, but excluding endorsement premiums or any charges for extended coverage endorsements and Seller’s attorney’s fees. Buyer shall be charged with expenses for recording deed(s) of conveyance, fees for the filing of any deed or mortgages, and Buyer’s attorney’s fees. All other costs shall be charged according to the custom of the area. 7. When the Title Company shall be ready to deliver its proforma title insurance policy to Buyer, this Agreement shall be deemed to be consummated and Seller shall at such time be entitled to receive all monies held by the Title Company for delivery to Seller. Buyer shall at such time be entitled to receive the Title Company’s insurance policy. In the event the Title Company shall decline to issue its title insurance policy, this Agreement shall be null and void and the Deposit shall be returned to Buyer. (b) Terminate. Terminate this Agreement, in which event neither Seller nor Buyer shall have any further obligations under this Agreement and the Buyer shall receive the prompt return of the Deposit.